Join us for a virtual studio tour! 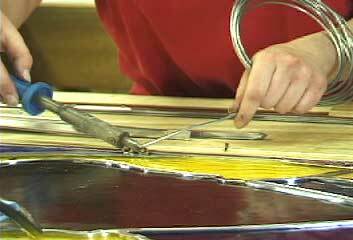 Here, we discuss the process of designing and handcrafting our stained glass windows along with an overview of aluminum frame fabrication. 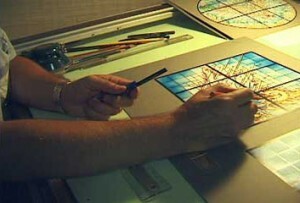 The design phase comes first in the many steps of stained glass production and lays the foundation for any project. 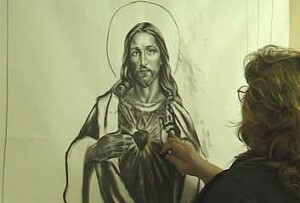 Our artists can create in a variety of styles, ranging from traditional to modern/experimental. 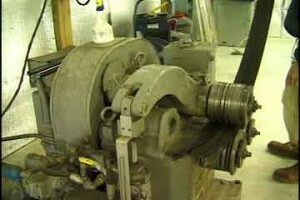 Several copies of the original cartoons are made for use in the various aspects of production. Next comes the cartooning phase where our artists produce a full scale rendering of the final design for use as a blueprint in the construction of each panel. 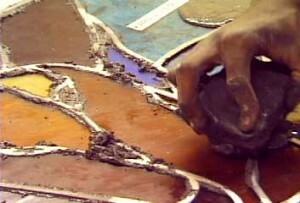 Our artists then choose the color and texture of glass that will be used in the finalized window design. 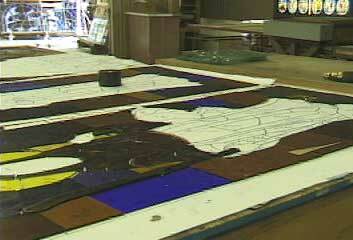 Next, the individual cartoon pieces are scissored out and sent to the glass cutters. Each glass piece is hand cut from the various selected styles of color and texture according to the paper pattern. The newly cut glass pieces are matched with their paper patterns and reassembled into the full design. 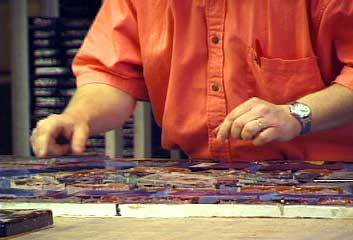 Our glazers then reassemble the cut glass, placing lead came in between each piece. 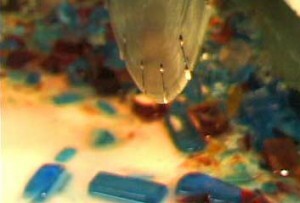 The came is then soldered together, producing the first glimpse of a finished panel. These panels are then waterproofed by brushing a special compound into the came. And finally, each panel is cleaned, scraped down, and reinforced with steel bracing. 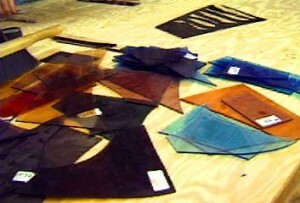 The process for crafting our faceted glass panels share many similarities with that of the lead-styled windows. 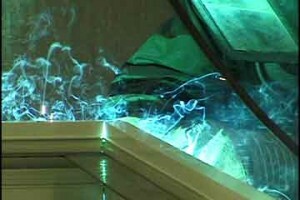 The steps from initial design through the selection of glass remain the same. 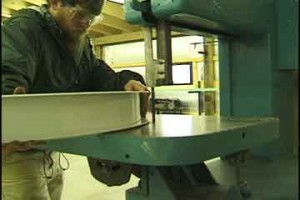 After the glass selection, the individual pieces are sawed if a smooth edge is desired. 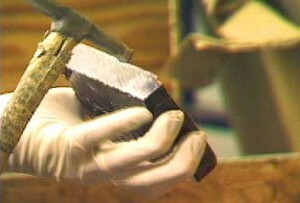 If a more faceted look is required, the pieces are chipped away with a hammer. 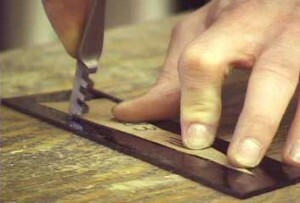 After either being sawed or faceted, the pieces are then laid out and spaced according to the final design. The final measurements for each window are sent to our frame shop. 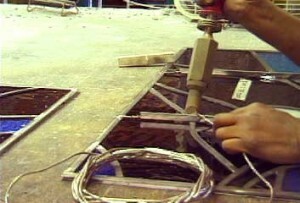 Here, the craftsmen cut, bend, and weld the aluminum frames. Frame fabrication is highly important, as they will be protecting and securing the stained glass panels after installation.